Stylish and elegant black satin dress gloves for evening and smart wear. Made in finest quality black stretch satin, they feature two rows of gold studs at the top on the outer edge. The gloves reach mid-way along the forearm. 'One Size Fits Most'. By Dents - reassuring quality. Please see our Product Description below for full details and important sizing information. Simply beautiful - such elegance. 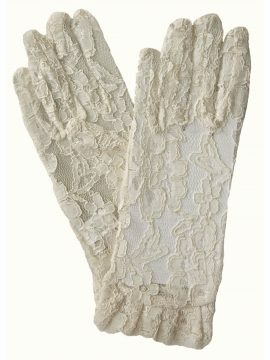 From Dents, these are fine quality short lace dress gloves which are so versatile and will make a perfect accessory to a wedding outfit, evening, another special occasion, for a vintage, traditional or more contemporary look. They feature a ruffled cuff and have an elasticated band at the wrist for a more stylish fit. 'One Size Fits Most'. NOTE: Gloves in images have white card insert to show the lace detail more clearly. Please see our Product Description below for full details and important sizing information. (RRP £99.99). 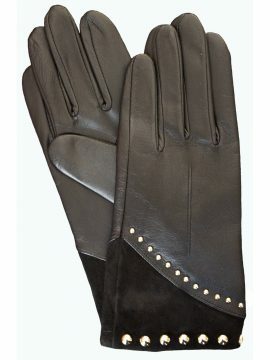 Elegant ladies leather gloves from Dents made from soft hairsheep leather. 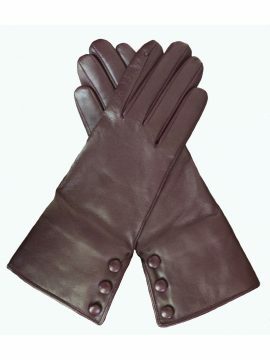 The gloves feature 3 leather-covered buttons and a split opening on the side. The cuff is lined with a luxuriously soft black fur trim. Available in Bordeaux or Mocca Brown. Presented with a Dents ribboned gift bag. Please see our Product Description below for full details and important sizing information. (RRP £69.99). 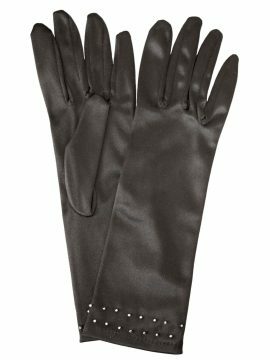 Stylish Dents ladies leather gloves made from soft, smooth hairsheep leather, the finest quality glove leather, combined with a soft suede cuff and gold-coloured stud detail on the back. Available in black or mocca brown. These gloves are presented with a Dents ribboned gift bag. Please see our Product Description below for full details and important sizing information. 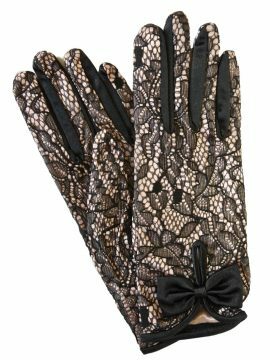 These elegant and delicate, fine quality long black fingerless dress gloves/mittens by Dents are perfect for special occasion evening and party wear, vintage or more contemporary. They are made in lightweight stretch tulle (fine net) fabric with an interwoven dot pattern. The gloves reach over the elbow along the upper arm and are a slim fit on the arm. One size. Please see our Product Description below for full details and important sizing information. (RRP £159.99). Just beautiful - these Dents long leather gloves are of the finest quality and fit available. Made from hairsheep cabretta leather, they are butter-soft to touch, yet are very durable, with a suppleness, strength and lasting comfort which helps the gloves fit properly. They are full length, reaching high on the upper arm and have a musketeer-style palm opening with 3 leather-covered buttons and leather loops. The gloves are unlined - possible only because of the quality of the leather. Available in black. 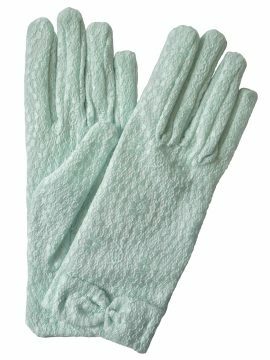 These gloves are presented with a complimentary Dents ribboned gift bag. Please see our Product Description below for full details and important sizing information. 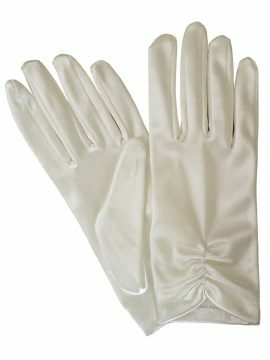 Finest quality 3/4 elbow length long satin gloves by Dents. In a classic plain style, they are a perfect and versatile accessory for a vintage or more contemporary look to complete your outfit for weddings, special evenings and other occasions - or just for fun. Made in soft stretch satin for a comfortable and elegant fit. 'One Size Fits Most' Available in 7 colours including black, white, ivory, silver and bronze. Please see our Product Description below for full details and important sizing information. 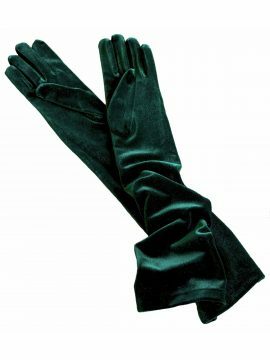 These long satin gloves by Dents are truly elegant and are the finest you can buy, both for quality and fit. In a lovely smooth stretch satin, they are a luxurious accessory to complete your outfit for a formal, vintage or more contemporary look, for that special occasion. Length: 22in/56cm (16BL). 'One Size Fits Most'. Available in 14 colours, including black, white, ivory, navy, amethyst and red. 4 NEW COLOURS: Royal Blue, Teal, Fuchsia, Violet See Product Description below for more details and sizing information. Long velvet gloves in luxuriously soft stretch velvet, just gorgeous to wear and an ideal accessory to your autumn or winter outfit - whether it's for a formal occasion, a special evening or just for fun, and whether it's a vintage or retro look you are after or something more contemporary. Made by Dents, these long velvet dress gloves are the finest quality and fit that you can buy. They are full-length, reaching above the elbow. 'One Size Fits Most'. Please see our Product Description below for full details and important sizing information. Beautiful fine quality lace dress gloves by Dents in delicate pastel shades that are perfect for spring and summer wear as a lovely accessory for your outfit, whether it is a vintage or more contemporary style. They are made in stretch lace fabric and have a bow cuff. 'One Size Fits Most'. Available in 4 pastel colours: cornflower, lavender, mint and peach. Please see our Product Description below for full details and important sizing information. Elegant, finest quality ruched short satin dress gloves by Dents in beautifully soft and shiny stretch satin - just perfect for completing your special outfit, whether it is for a vintage or more contemporary look. The gloves feature ruching at the wrist on the back for a more stylish fit. 'One Size Fits Most'. Available in black, ivory and white. Please see our Production Description below for full details and important sizing information. Perfect for so many occasions to complete your outfit, e.g. vintage/retro, traditional or more contemporary, these pretty and elegant, finest quality short dress gloves in satin with black lace overlay feature a keyhole opening at cuff with black satin bow and piping. Choose from black or blush pink satin. By Dents. 'One Size Fits Most'. Please see our Product Description for full details and important sizing information.